Adastral Park is an exciting cluster of high-tech telecommunication and technology companies. Based in Suffolk, Adastral Park is at the heart of the UK's digital ecosystem. It combines a national operation centre, test facilities and a global R&D unit, all set amongst a thriving community of collaborative technological innovation. The park is home to BT's innovation labs and Innovation Martlesham (an established and growing cluster of over 100 high-tech ICT companies) as well as educational initiatives such as the Tommy Flowers Institute. We have a number of apprentice, graduate and other full time vacancies for suitable applicants. 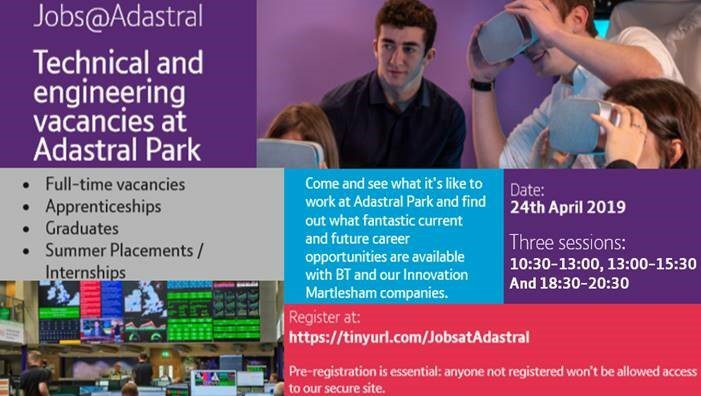 Come and find out about the wide range of job opportunities which BT and its Innovation Martlesham partners have here at Adastral Park. You can register using the More Info button for our event taking place on the 24th of April. Please select either the daytime or evening slot, and remember we are a secure site so anyone you are bringing along MUST be registered below to gain access to our site. The information you provide will be used for the sole purpose of the recruitment fair and any follow up information sent to you linked to the fair. Your details will not be passed to any third parties without your prior permission and will be secured safely by BT and deleted 3 months after the event closes.